The Chennai ISKCON is the largest of all the institution’s temples in the state of Tamil Nadu. You can go here for some blissful enlightenment, and aratis that are soul-awakening! The temple also serves delicious bhog twice a day. Love this? Explore the entire list of places to visit in Chennai before you plan your trip. Fancy a good night's sleep after a tiring day? Check out where to stay in Chennai and book an accommodation of your choice. 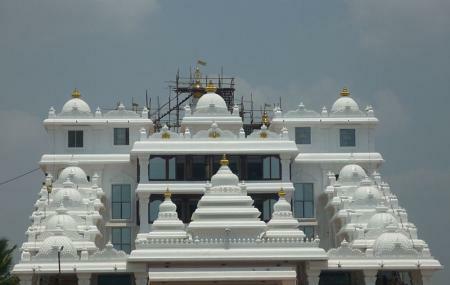 How popular is Iskcon Temple Chennai? People normally club together Arignar Anna Zoological Park and I I T Madras while planning their visit to Iskcon Temple Chennai. One of the best place I have ever been to. It was extremely quite and a pleasant ambience. There were a lot of beautiful painitings which portrayed old epic stories. I don't go to temples much but I felt extremely relaxed once I came back from there and wished to visit the place often.There is a huge parking space. I would recommend this place for anyone who is in the pursuit of peace. It's best to go on weekdays as there will be less crowd so that you can enjoy the place at it's best!!!!!! This one is a must visit if you are in Chennai or have come to visit Chennai. Beautiful temple, much beautiful are the idols and the environment is so serene. Even after you leave the place "Hare Krishna Hare Rama" will keep reverberating in your ears !! You can get great prasad and other paid food items too! I visited this place during Aarti time. This is a Chennai branch of world famous ISKCON faith which worships Krishna. This place is spiritual and you can seat, pray and meditate here. You will find many books of the philosophy which you may find useful. The place has an attached Snacks & Restaurant place. It's an interesting thing about the Temple. The restroom isn't free, it's 5 rupees. For ISKCON temple it's not appropriate. BUT if you're taking money for restroom at least Clean it properly. Water is everywhere on the floor. Barefoot walking on this water in the restroom. In this water is urine drops of course, multiplying bacteria and fungi, etc. It's totally Karmic restroom. The authorities of the temple do not understand where they are and do not understand what they are doing? Where is the ISKCON Standards? For the temple it is indecently dirty. In the temple there are many membranes who sacrifice big money on the deities and to the temple. And even they need to pay money to go to such a dirty toilet?